Some inverters are not designed to handle some loads like a rooftop air conditioner for instance. My recommendation is to find the trailer you like, see how it is equipped and then upgrade as necessary depending on your planned use of the RV. Just about anything can be done in the aftermarket to upgrade just about any RV according to the owner's wishes! That's what's great about our aftermarket! Just so you know, if you're going to purchase an aftermarket inverter, I always recommend investing in a true sine wave output inverter. 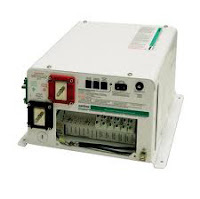 Modified square wave inverters are more limiting than true sine wave inverters. You'll pay more up front, but with the technology today, the true sine wave output is just as smooth a waveform as electricity from the grid. Likewise, some fivers are equipped with a generator. Of course, if you opt for a gasoline unit (vice propane), it will require extra space for a fuel tank too. You'll find AC generators on the larger units, but again, just about anything is possible in the aftermarket! Then again, it's not uncommon to find RVs sold without an inverter OR a generator. You want AC electricity? You'll have to plug into a shoreline source. Choose wisely, but remember, the aftermarket is a wonderful place!